Stove Stacking – Problem or Challenge? Household energy in Ghana, as in much of the world, lies at the intersection between tradition, affordability and convenience. Energy like charcoal is reliable, affordable and readily available, and so it becomes a tradition that households are built around. But traditions can be updated if people see the value of changing them. As liquified petroleum gas (LPG) becomes easier to use throughout the country, many more families are beginning to cook with it. But this transition affects households differently, and each one is climbing the energy ladder from charcoal to LPG at their own pace. On a recent trip to Ghana, I got to accompany Andy, an Envirofit Ghana sales agent, through the streets of Accra New Town while he visited households to track their weekly LPG use. We were doing market research for SmartGas, Envirofit’s forthcoming LPG service. Almost every house we visited used both charcoal and LPG, a phenomenon in the cookstove sector commonly known as “stove stacking”, where families use different combinations of old and new technology at the same time. As we followed each homeowner back to their kitchen to weigh their LPG tank, I began to wonder if we as a cookstove industry should be opposed to stove stacking, or understanding and innovating around the role different cooking solutions play in our lives. We met with one of the families on our rounds while they sat outside in their courtyard making fufu in a sturdy, hourglass shaped clay pestle. Fufu is a thick, starchy dough made from cassava and plantains, and must be softened so that it’s edible by smashing it repeatedly with a mortar – a long, heavy piece of wood with a blunt end that looks like a combination of boat oar and baseball bat. While her son repeatedly raised and dropped the pestle, the mother reached into the mortar between his strikes to turn the dough with a rhythm that came from years of practice. She spoke with me about how she cooked for her family, which for her meant using charcoal and gas every day. Though the household had an LPG stove and they bought fuel as often as they needed it, she preferred fufu dough prepared over a coalpot because it cooked faster and gave it the traditional flavor that she liked. I asked her if she would ever want to cook with only LPG. She gave it some thought and answered no, she would always use charcoal for some dishes. Watching her in the courtyard surrounded by her family, I wondered if she wanted to keep using charcoal because of the moment happening before me. Would making fufu over an LPG stove still be something she shared with her children? On her patio also sat a cheap, disposable coalpot. I asked if she’d be interested in a modern one that cooked twice as fast with less than half the fuel. 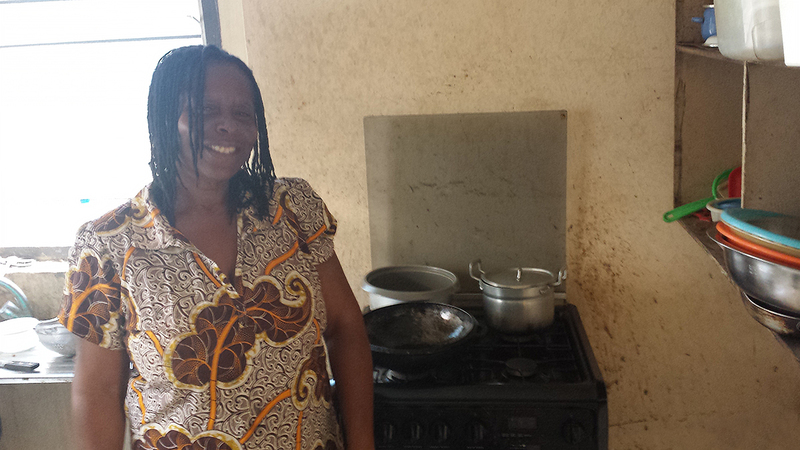 She said yes, and we were able to replace her charcoal stove with a more efficient stove. Though cooking with LPG wasn’t a challenge for them like it can be for many people in Accra, she will continue to cook on gas for most meals, but use charcoal for the traditional dishes that bring her family together like fufu and banku. 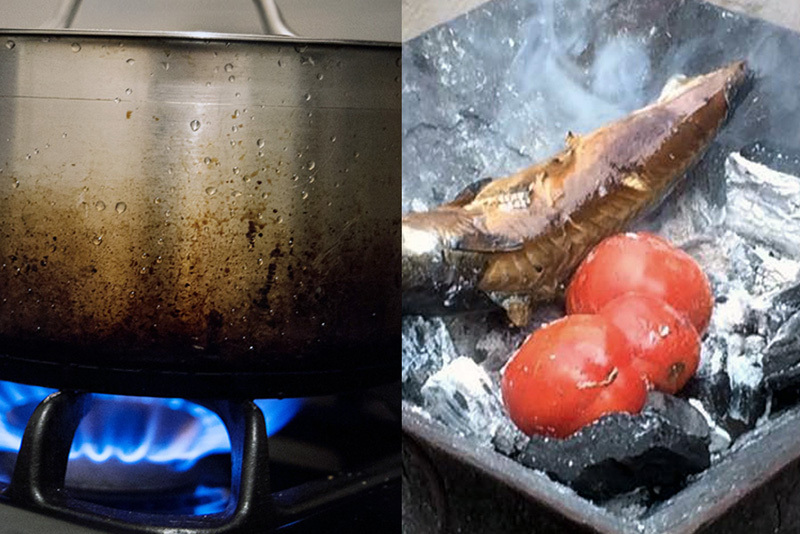 In the same way that American’s use charcoal to cook some traditional foods like steak and hamburgers, clean cooking solutions are needed to accommodate the different traditions of cooking. Later in the day we visited Rosemond’s house. We had stopped by while she was cooking, and she welcomed us into the kitchen while she finished frying some plantains as an afternoon snack for her family. Rosemond had a quick smile and sharp sense of humor, and told us she sews and works at her church. 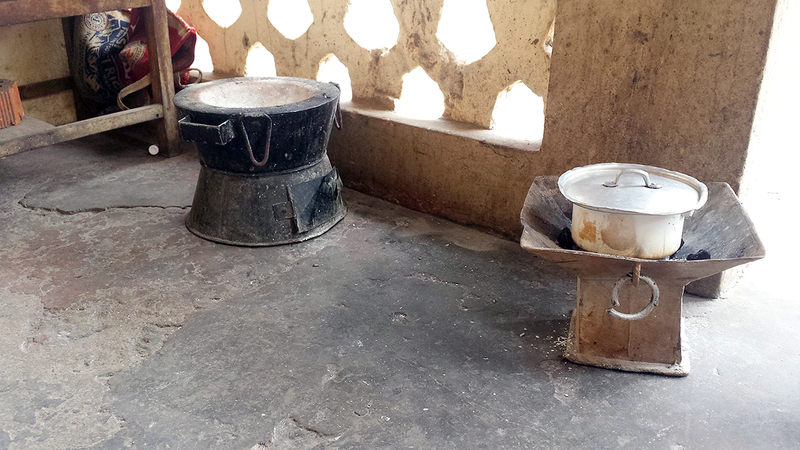 Her LPG stove looked modern, with four burners and an oven, and sat against the far wall of her kitchen. 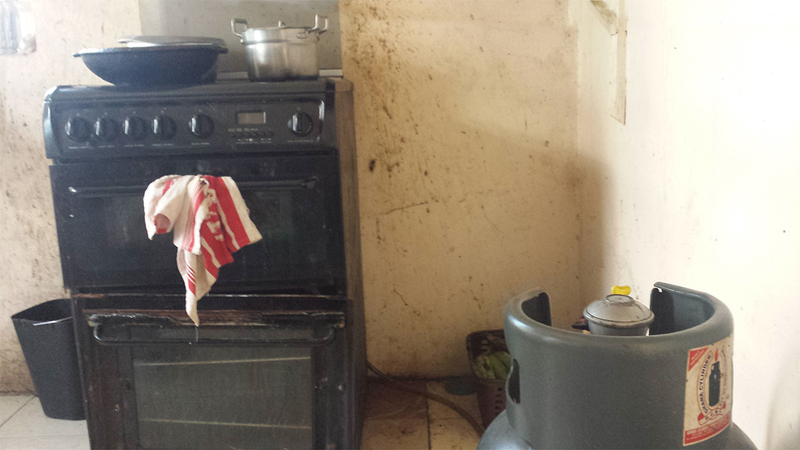 A dark yellow hose snaked along the wall from the back of the stove to a squat gray LPG cylinder in the corner. I asked her if she cooks on charcoal as well, and she said that she always cooks on LPG unless she is out of gas for a few days every month. In this way she uses her charcoal stove as an emergency backup. I thought about the few times in my life I had a power shortage and was unable to cook. Usually it meant that I skipped a hot meal for the evening. But in a country like Ghana with fluctuating gas shortages and long walks to refill LPG tanks, this is a frequent occurrence. I asked why she was interested in the SmartGas program and she gave the typical answers of convenience and cleanliness, but also singled out that having the gas delivered to her home removed the biggest inconvenience that LPG had for her. She sees a service like SmartGas for Ghana as a sort of inevitability for the modernizing country, and says she will gladly be a customer because it seems like the modern, sensible thing to do. While SmartGas could replace her need for stove stacking, the common challenge of gas shortages makes this step of climbing the energy ladder a critical challenge. Andy and I visited many other homes as we made our rounds, and heard similar stories from other families who used both charcoal and LPG. Charcoal was preferred for groundnut soup. Others liked LPG because they could use it indoors and didn’t have to worry about rain. 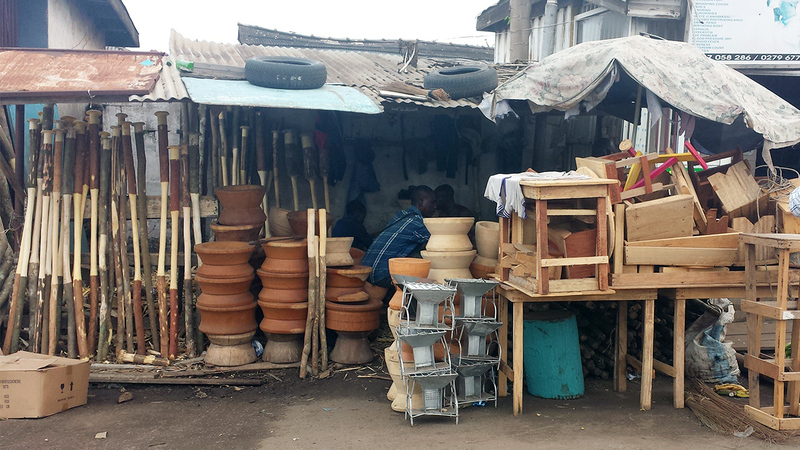 Stove stacking is a part of daily life in Ghana, but it is also evidence that a change is taking place. By providing more household energy options like LPG, Envirofit can meet people where they’re at with the best choices available along each rung of the energy ladder. Instead of viewing stove stacking as the problem, we should be viewing the stove as one of many tools in the kitchen. Instead of trying to end stove stacking, we should ensure that each family is using the best and most efficient tools to cook that will deliver on taste, tradition, and convenience.